PPL and Riverstone Holdings have agreed to satisfy market power concerns over the spinoff of their generation by making only cost-based offers for the more than 650 MW that their new company will keep in eastern PJM. The use of cost-based offers was one of two mitigation options the Federal Energy Regulatory Commission said it would accept in its conditional approval of the companies’ plan to combine their generation assets into a new company, Talen Energy. The companies revealed their response to FERC’s options in a Jan. 27 informational filing (EC14-112). “After full evaluation, both parties believe the enhanced mitigation will not have a materially different impact on the future operating results of Talen Energy than the original proposal,” the company said in a news release. In their application, the companies proposed two mitigation packages. One involved divestiture of six Riverstone plants and one PPL plant in New Jersey and Pennsylvania — all combined-cycle plants — for a total of 1,315 MW. The second involved the same six Riverstone plants, plus a 399-MW coal-fired plant in Maryland and two PPL hydro plants in Pennsylvania, for a total of 1,346 MW. FERC’s Dec. 18 order said the companies would have to sell all of the plants in the two options — totaling about 2,000 MW — or limit energy and regulation market offers for the approximately 650 MW Talen would retain under either package to cost-based rates. The companies said they would not decide on which of the sets of power plants they will sell until the closing of the PPL-Riverstone spinoff, which is expected in the second quarter of this year. 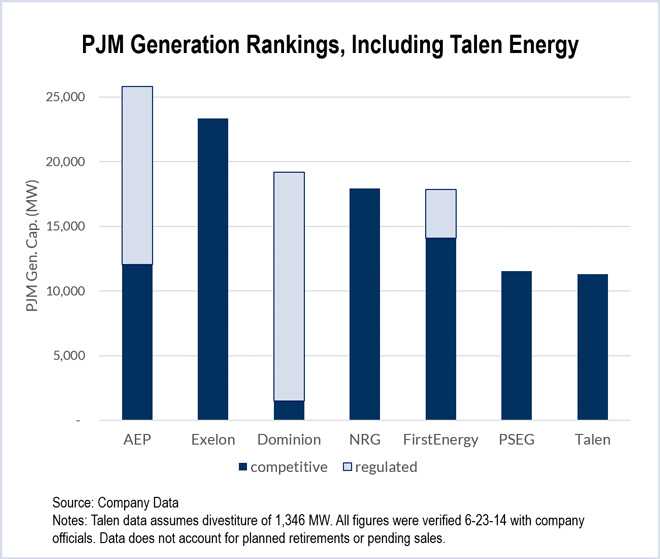 Post-divestiture, Talen will be the seventh-largest generation owner in PJM. “We have 12 months from the closing date to announce the divestitures, and they may take somewhat longer than that to close on those,” PPL spokesman George Lewis said Thursday. The companies said that no company with more than 10% of PJM’s summer installed capacity would be permitted to bid for the plants. That would leave out Public Service Enterprise Group, Exelon and NRG Energy. Talen Energy will own almost 14,000 MW of capacity — about 11,000 MW in PJM — after the divestitures. In addition to the plant sales and cost-based offers, FERC also required Talen to offer into PJM markets the same plants and output as PPL did, prohibiting it from holding back generation to drive prices up. The deal still needs approvals from the U.S. Department of Justice, the Nuclear Regulatory Commission and the Pennsylvania Public Utility Commission. FERC granted Talen Energy’s request to sell four generators totaling 1,351 MW to satisfy divestiture conditions. 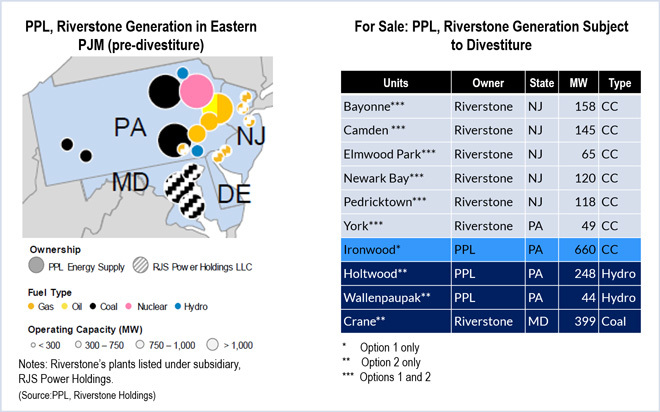 PPL and Riverstone Holdings have offered to divest about 1,300 MW of generation from their 15,000-MW combined fleet to avoid market power concerns over their planned spinoff, Talen Energy.